The winds got up again this afternoon, making it difficult to paint and hold supplies in place. But it also kept the heat from rising. I found a tree that offered plenty of shade, and went to work on this trackside structure, stopping occasionally to allow passing freight trains to obstruct my view (one Kansas City Southern, one Union Pacific). I painted this shack at last year’s Waxhachie Paint-Out, but this time decided to paint it larger (11 x 14 instead of 8 x 10) and incorporate more of the surrounding trees. I did not time myself, but estimate that I had this one finished in less than 90 minutes. Two paintings in one day has exhausted me. 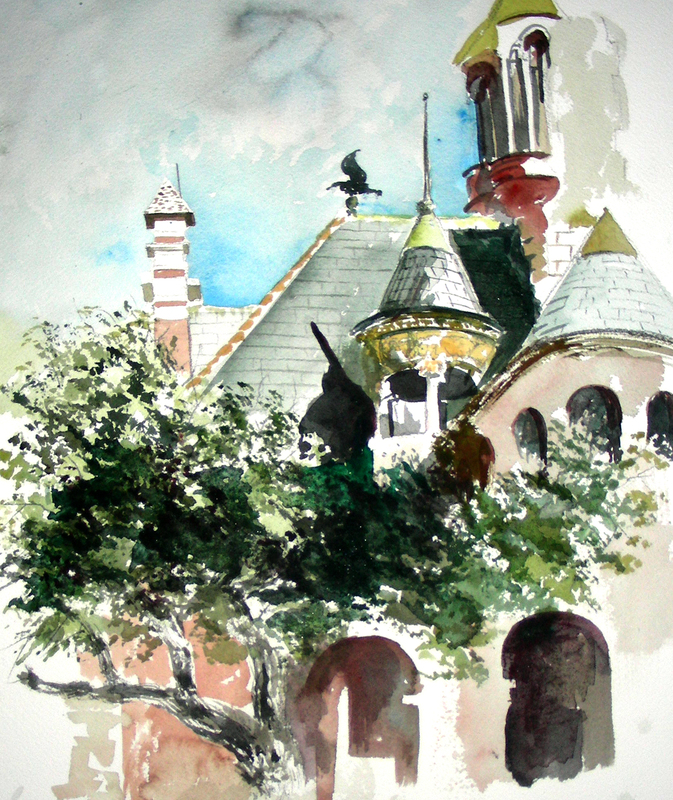 School resumes tomorrow (one more week of it) and I will return to Waxahachie for a new plein air adventure as soon as that final bell rings! What a splendid morning to engage in plein air painting. Temperatures were in the seventies this morning (a welcome relief from the triple digits we’ve experienced the past three days). Waxahachie has some beautiful parks and walking trails. One of the trails winds its way under this 1920’s bridge. When I looked up at the gathering storm clouds, I knew this was going to be my first painting attempt of the day. As it turned out, I got the best of both worlds: I laid in the sky first, which was overcast and filled with billowing storm clouds. Then the sun popped out, the sky turned bright blue, and shadows returned to the bridge, along with highlights in the foliage enveloping this structure. So, I got to put in the dark turbulent sky, and then got to follow up with nice shadows and highlights. I call that a perfect world for painting! Thanks for reading. I went on to do another quick painting, so I’ll prepare that one to post next. Today was the third day of the Paint Historic Waxahachie event. I rose early this morning and drove straight to the town, looking for beautiful historic homes bathed in sunlight. This was my choice today. It turned out to be an excellent choice, as the wonderful residents of the home came out several times, bringing me cold bottles of water and fruit drinks. The sun got brutal long before I finished, and had it not been for their wonderful hospitality, I probably would have stopped to go back the the Ellis County Art Association for bottled water, air conditioning, a comfortable sit-down, etc.! As it turned out, I was able to stay with the painting and see it through. 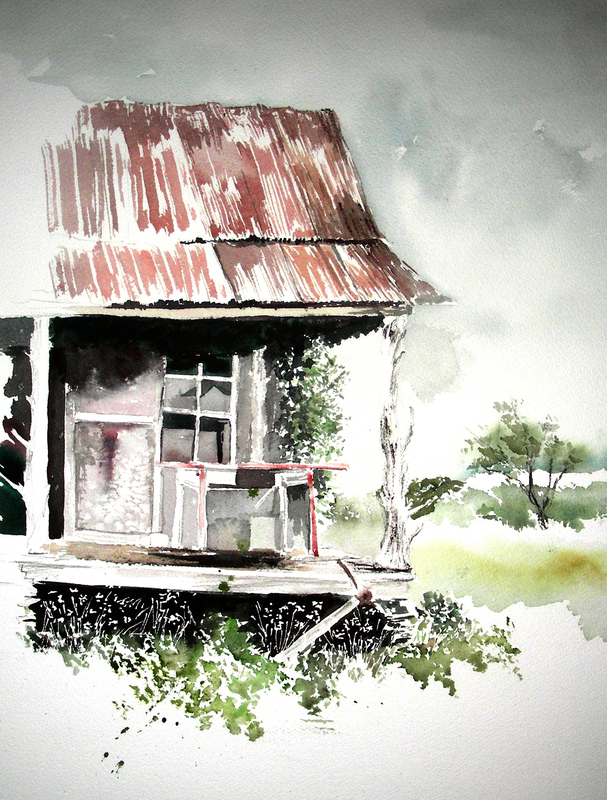 I was not successful in matching the colors of the house to my pigments on the paper. I always hate it when I come up short in that respect. The house was absolutely gorgeous, and “popped” with color in the sunlight. I’ll never forget the sensations I felt when I first saw it from my driver’s seat. I had to turn the Jeep around and come back for a second look, and it only took me that second look to decide to give it a try. I’m reminded of how the great American painter Edward Hopper often selected compositions to paint, when the said they “put out a call.” He felt invited to enter that space and create a work of art. That was exactly how I felt early this Sunday morning. And the residents greeting me pleasantly and offering me cold beverages made it all the better. Following the 90-minute Quick Draw event Saturday morning in Waxahachie, I found the 100-degree temperatures intolerable for painting. So, after driving all over the town for an hour-and-a-half, I decided to return home (40 minutes away! ), take a refresher nap, and return around 5:00 to greet longer shadows, not-much-cooler temperatures, but inviting scenes nevertheless. 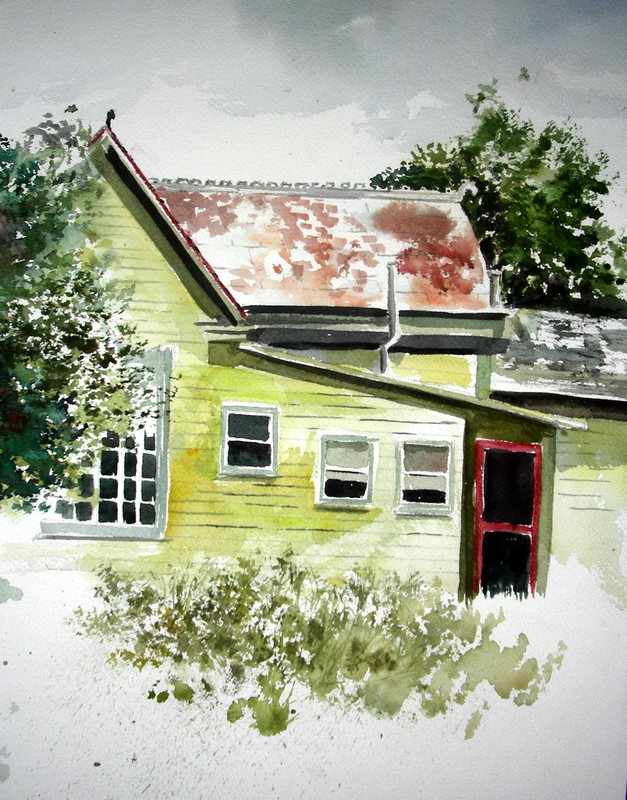 I painted this home last year, looking at it from the other side. I could not help noticing the shadows cast by the giant tree all over the sides of the house, so I thought I would give it a try. I spent a little over 2 1/2 hours working on this piece, not feeling rushed, and thoroughly enjoying the solitude. There were no painters around me this time, the clock was not a factor, and I simply enjoyed chipping away at the composition. I have been exasperated, trying to match up green colors with the foliage I paint, and for the first time, I think I got pretty close tonight. Tree bark colors have been another nemesis for me, and that is why I chose this perspective with its enormous, impossible-to-avoid tree. I enjoyed working on the bark textures, studying the warm and cool neutral hues, and trying to get them onto the paper. Out of three painting attempts I’ve made at this Waxahachie event, I am by far the most pleased with this one. My plan is to arrive at the town early Sunday morning, and see if I am able to complete two paintings by noon, then leave before the temperatures reach 100 again, which they are expected to do. Thanks for reading. I’ll post tomorrow’s work as soon as I can. The winds were fierce this morning, but the Quick Draw was fun. The event lasted 90 minutes (8:30-10:00) and I was pleased that this painting brought a fair price at auction. 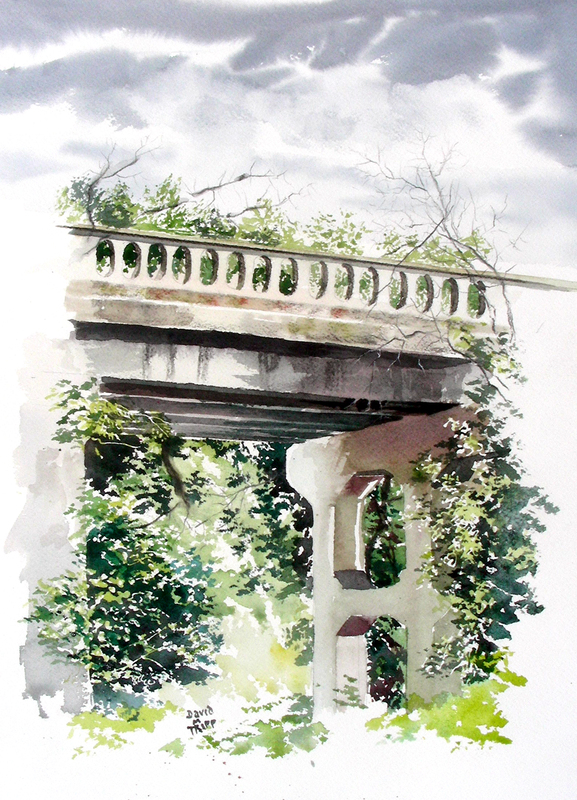 The winds and the 100-degree heat got to me after lunch, so I chose to make the 40-minute drive back home, and return in the late afternoon to attempt a second painting. I’ll post that one next. Today was registration day for the Paint Historic Waxahachie event. Tomorrow morning early will commence with the Quick Draw. Contestants will have 90 minutes to paint anything in view from the courthouse square, and then the paintings will be “silent auctioned” immediately afterward. Today after school, I drove to Waxahachie and took a crack at this Ellis County Courthouse. Temperatures reached 101 degrees, but fortunately I was under a shaded awning. Unfortunately though was the high wind that came up. My folding chair that was holding my brushes, bottles of water and various watercolor supplies was lifted and tossed, so I got to go and gather all my scattered art supplies. This happened twice. That was not nearly as bad as the problem I had wrestling with this piece. I’m painting larger than last year, on a 12 x 16″ block instead of a 9 x 12″. I didn’t realize what a difference those extra inches would make in filling out a composition. It’s going to take some work. I worked much longer than 90 minutes on this piece, so I’m not sure if I’m going to tackle the courthouse in tomorrow’s Quick Draw session. Thanks for reading. I’ll be posting again tomorrow. 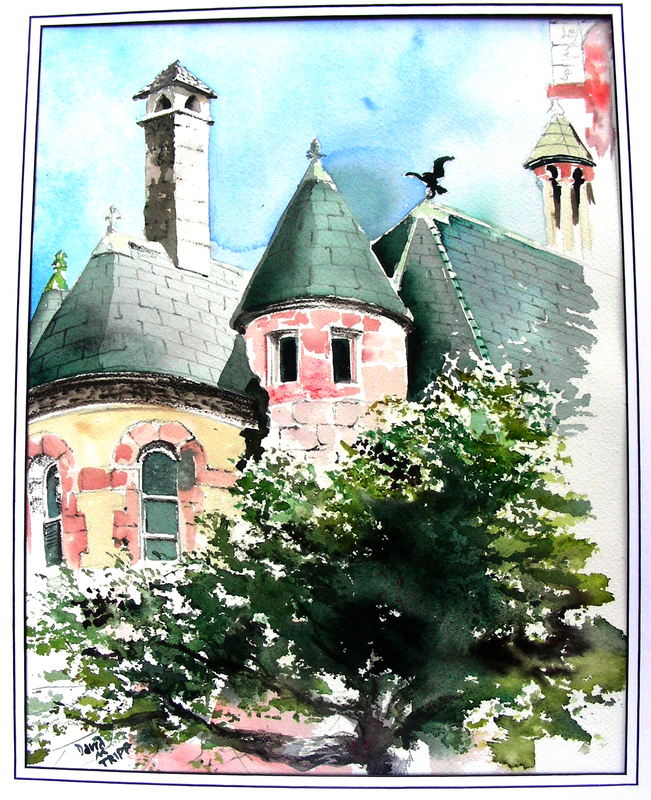 I have posted my last “practice” plein air watercolor sketch before the Big Event. This was done yesterday late afternoon at Lyndon Acres in Burleson, Texas, where my wife rides. As she worked her horse, I tried once more to capture the colors of sunwashed pastureland and deep verdant shadows off the trees. I still haven’t found what I’m seeking, but I’ll keep experimenting. 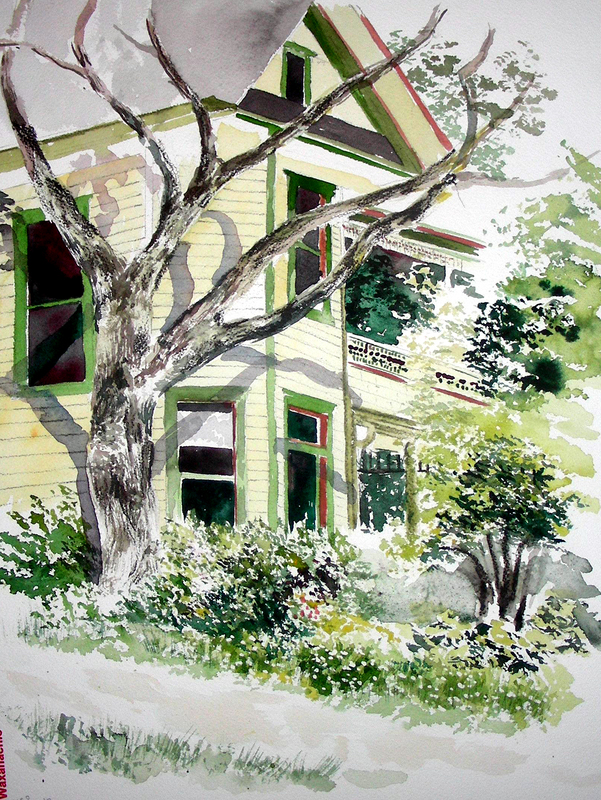 Today (Friday) begins the Paint Historic Waxahachie plein air event, which will extend from today May 27 until Sunday, June 5. Last year, I managed to create nine paintings in that space of time. I hope to hit that mark again this year, though I confess I’m still not quite as “fast” as I was this time last year. I have spent so much time in the studio these past few months, and less time outdoors, that I realize I have grown slower and more methodical in my painting. Maybe I can break through all that this next week. I promise to post tonight what I manage to get done this afternoon, on the first day of this event. 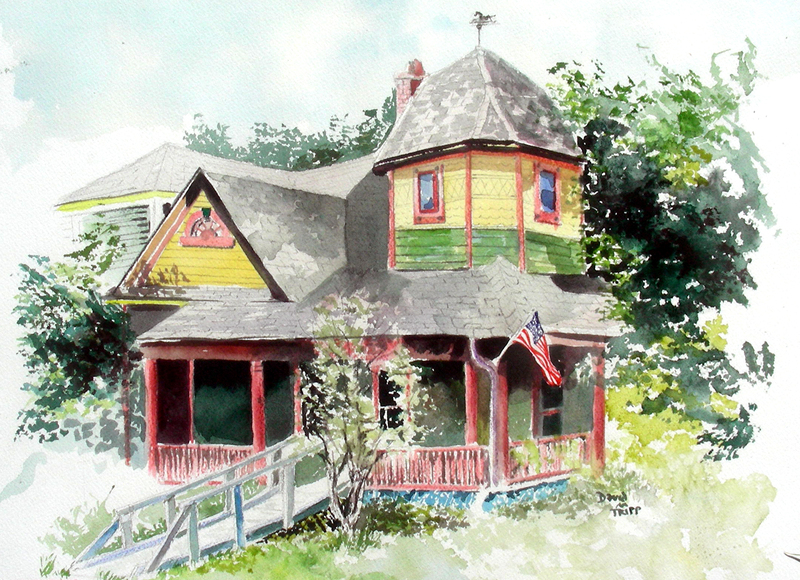 In just a few days, I have a major plein air painting event taking place in Waxahachie, Texas. For several weeks now, I have been brushing up on plein air practices, which are profoundly different from studio approaches. 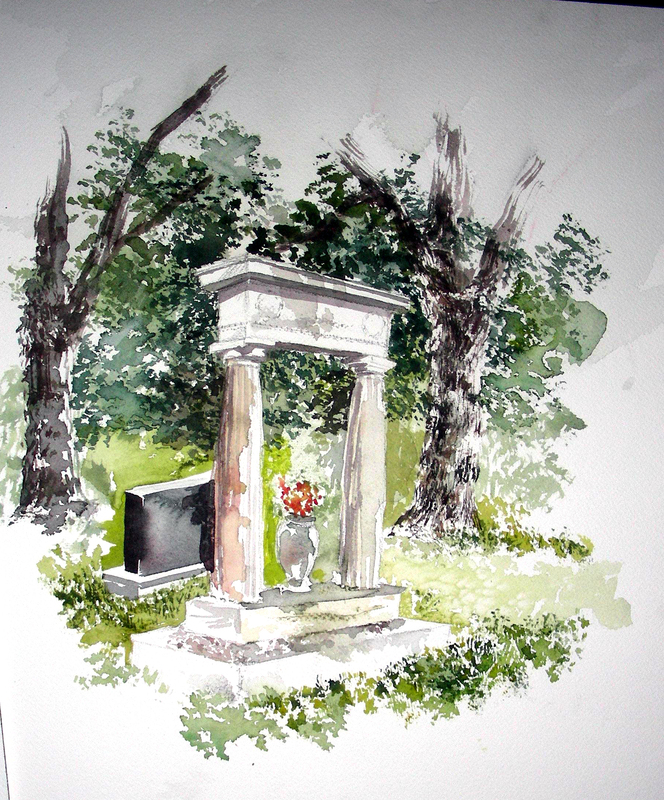 This afternoon, as the north part of the city of Fort Worth grew dark with gathering storms, I traveled to the Greenwood Cemetery and attempted a quick sketch rendering of this monument. I worked on it for one hour and ten minutes. 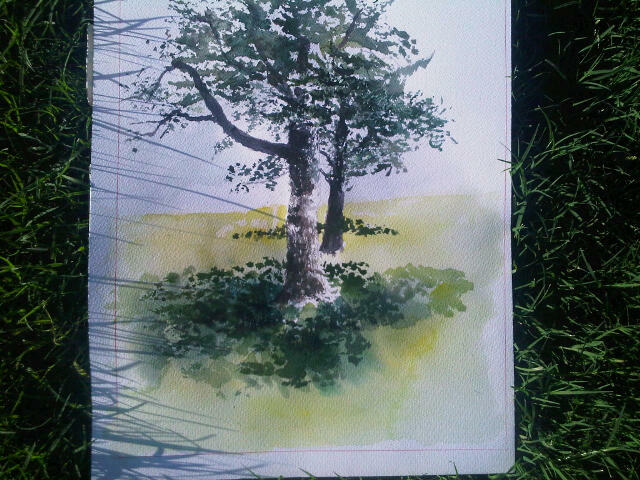 I’m getting faster, but last summer I was finishing plein air watercolors in as fast as 45 minutes. I still have a ways to go. This is the first time I’ve attempted to capture Greek-style columns in watercolor. I enjoyed the experience, though I’m not too pleased with the result. However, I remind myself that this is a first. I’ll eventually get to where I want to go with Greek monuments. I’m just glad the storms held off till I was finished with this piece. Thanks for reading. Hope to see you in Waxahachie beginning this weekend. 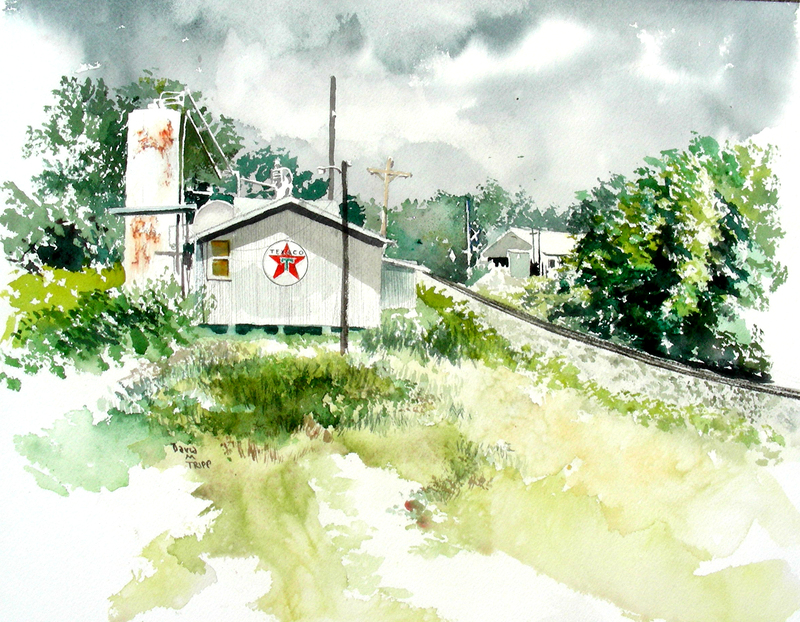 This is the plein air painting demonstration I performed on the first day of the Plein Air on the White River event in Cotter, Arkansas.